Yes, and it’s as beneficial as it is fun to learn! A growing number of forward-thinking companies are training their employees in the same mental agility skills that enable a team of improvisational performers to create an unscripted scene on stage. Bob and Lee from Advantage Improv employ the techniques used for decades by these performers who must work within predetermined parameters, just as talent development professionals do on a daily basis. By helping participants to experience the power of the “improv mindset,” this workshop will deliver insight and tools that help talent development professionals improve how they communicate, engage and lead. This program is ideal for all human resources professionals, talent development managers, trainers, instructional designers and performance consultants. Please join us for this fast-paced, interactive, half-day workshop! 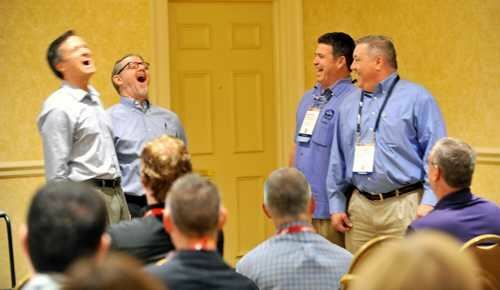 Several years ago, Advantage Improv co-founders Bob Doll and Lee Godden met while performing improvisational comedy on stage, and discovered they had similar backgrounds as business executives and corporate educators. With an improv-for-business mindset, they soon co-founded Advantage Improv. Their goal: To teach forward-thinking individuals, organizations and teams how to boost creativity, effectiveness and profits by leveraging proven improvisational techniques. Cancellation/Refund deadline is October 13.